Exhibition "Empty Chairs Waiting Families"
On April 13, 2017, ACT and the International Committee of the Red Cross organized the first public exhibition of chairs made by families of missing persons within the framework of their accompaniment project. 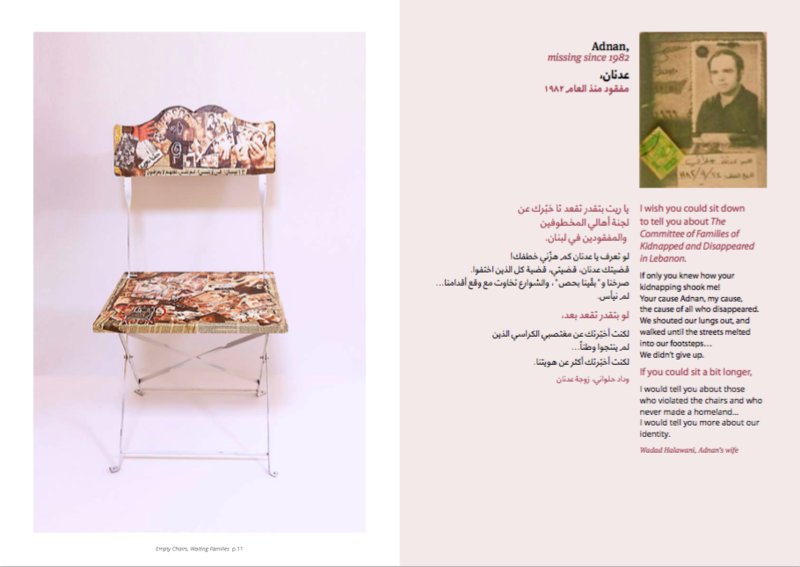 These chairs, made by families of missing persons in Saida, Baabda and Aley tell the stories of those who went missing and represent the empty space left in the lives of their families. They are a reminder to society of the struggle of the families left behind and their right to know the fate of their loved ones. The project is a partnership between the International Committee of the Red Cross in Lebanon and Act for the Disappeared in collaboration with Artichoke studios.